The Church of our Lady of the Immaculate Conception at Everton Park was blessed and opened by the most Rev James Duhig, Archbishop of Brisbane, on 15th May 1960. It was built on land donated by the Downey family, a community-minded family who were prominent in the Catholic community. Father Pender, the Parish Priest at the time, donated the altar and dedicated it in perpetuity to the memory of the Downey family. The Good Samaritan Sisters donated the altar linen and the children donated a set of vestments. Over the past years, there have been a number of additions and alterations to the church building – the southern verandah was enclosed, the northern side extended, a bell tower added, the pulpit and altar rails removed and the sanctuary upgraded. The community centre, a much-needed facility, was added and the church grounds were upgraded to improve drainage and enhance vehicle access and parking. Additionally a number of landscaping projects have been undertaken over the years to help beautify the grounds. It was originally intended that the church building would eventually become part of an Everton Park catholic primary school with a permanent church built in front. A high school was to be constructed on the corner of Trouts Road and Redwood Street. Those early plans were of course overtaken by other events and priorities and neither eventuated. Our Lady’s 25th anniversary in 1985 was celebrated with Bishop John Gerry and past priests of Everton Park. Over the years many faithful lay Catholics have contributed, built up and kept the faith alive here. Among them are: Downey Family Woodland Family, Wells Family and Curran Family to mention but a few. Father Joe Flannery was the last parish priest of Our Lady of the Immaculate Conception from 1981 until when it was joined to St. John the Baptist parish Enoggera in 2012. 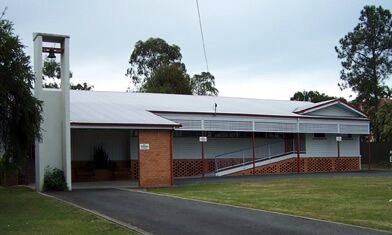 After the merging with St. John the Baptist, Bishop Joseph Oudeman was given the pastoral care of the new St. John the Baptist Enoggera/Everton Park community in 2012 as Administrator. This was followed by the appointment of Fr. Michel Grace as administrator 2012 – 2018 and currently Fr. Leonard Uzuegbu (19th May 2018 – date).